One of the very best concerts that I ever saw was Billy Joel and Elton John at the Ohio State University Stadium in Columbus, OH during their first tour together back in 1994. When I found out that they were touring again this year and would be doing a show at the Honda Center (formerly The Pond) in Anaheim, I was immediately interested in getting tickets to see them again and to give my wife the chance to attend. The timing for getting tickets turned out to be a bit of a challenge, as they went on-sale last December during the week that we were on vacation in Florida. The on-sale time, in fact, happened to precisely correspond with our dining reservation at Tusker House in Disney’s Animal Kingdom. Ticketmaster currently doesn’t have a mobile-friendly web-site that can be used for ordering tickets from a cell phone, so I ended up programming the phone number for their automated ticket ordering system into my phone. Their phone ordering system is a pretty big hassle to use and the process of ordering tickets used up the majority of the time we were waiting for our table at the restaurant, but I did manage to get the tickets ordered. Traffic between home and Anaheim can be pretty heavy on a Saturday afternoon, so we made arrangements for our son’s babysitter to arrive in time for my wife and I to leave home around 4pm, which we figured should be plenty of time for us to get there in time for the 7:30pm concert. The drive wasn’t overwhelmingly bad for a Saturday and we made it down to Orange County by 5:30pm, giving us enough time to stop off at a nearby mall for a quick dinner at the food court. 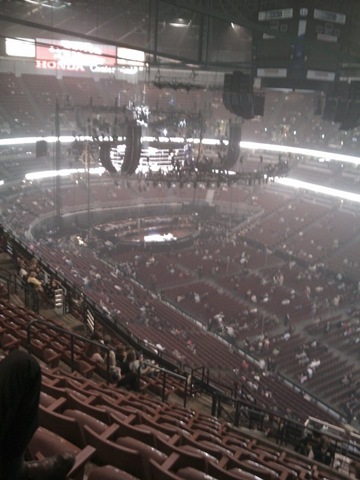 We then made it over to the Honda Center around 6:45pm or so. Traffic was a little bit heavy getting into the parking areas, but it wasn’t overwhelmingly bad. I did think that they would have benefited by a few more people directing traffic (particularly controlling access to the left turn lanes from Katella Ave.), but I’ve seen worse. I had been to the Honda Center (still The Pond, at that time) once before to see one of Billy Joel’s solo concerts back in 1999. While I didn’t remember the layout exceptionally well, I did recall that I had been seated in the cheap seats in the top tier for that show and that the view was still reasonably decent. Considering that the tickets time time were over $100 each for anything on the lower tiers, we went with similar seats again this time. When we first got to our seats, our first reaction was that we were awfully high up and far from the stage, but we really ended up being pretty happy with where we were. Our view, while distant, was unobstructed and from the front, which wasn’t true of many of the closer seats. The picture below, taken using my cell phone camera while we were waiting for the show to start, gives an idea of how far we were from the stage. The concert started about 20 minutes late (not too bad for a rock concert), with the lights initially going down about 1/2 way followed by an overture of instrumental versions of some of Billy Joel and Elton John’s songs, played as two pianos rose from beneath the stage. The house lights then went the rest of the way down as Billy Joel entered to "Yankee Doodle" and then Elton John entered to a very British tune that was extremely familiar, but I don’t know the title. The two greeted one another and then headed to their pianos to start an introductory series of duets.